This project idea came from a blog post I read by Rhys Goodwin. I’ve been working on a project for my car stereo and I’m trying to fit it into a very specific area of my front console to achieve a hidden unmodified look by hiding the wiring. I will certainly post more about that when the project is finished, but the problem I’ve run into is the shape of this area hasn’t matched up with any project enclosures I’ve found so far. That being the case I thought I would follow what Rhys did and cast my own enclosure. This project definitely proved to be a learning experience and as Rhys notes it’s harder than it appears. I found this out ultimately as the resin I was using apparently needed some kind of secondary catalyst to prevent it from being so sticky. In the end the project spanned about a week and I didn’t really end up with an enclosure that was as nice as I was hoping for. To start out I measured the dimensions of the center console area and used Google SketchUp to create a model of what I was hoping to create so that I could start to think more about the actual molds I’d need to build. The dimensions needed to be approximately 6.5 inches wide by 4.75 inches deep by 1.5 inches tall to fit into the console. 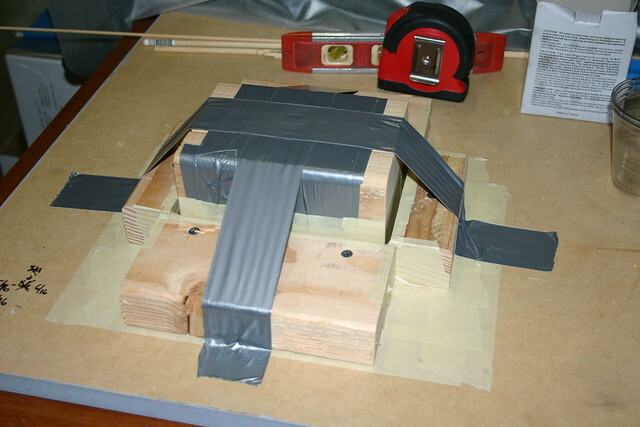 Using those measurements I created the model you can see below and the started hand sketching how I needed to create my wooden molds to ensure my enclosure was the specified size. 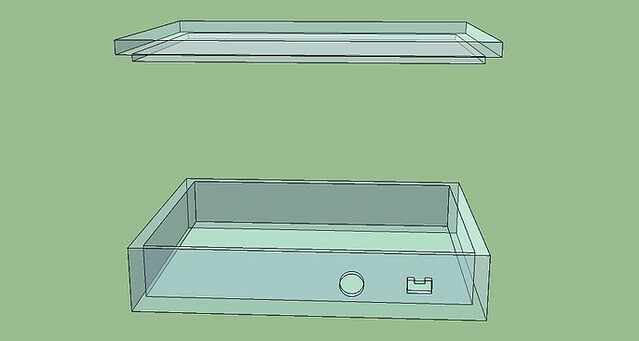 The Google SketchUp model I created of the project enclosure. Once I had the math done and drawings made on how I was going to create the molds I started the process of cutting and building my molds. To make sure everything was to size I spent some time on this stage measuring and squaring up all of my cuts and corners. Woodworking is something that I have done in the past so this was not a new experience for me, but as Rhys noted in his post if something isn’t right here it will look worse in your final cast enclosure. At this point I had my wooden molds made and decided it was time to go look for resin and cast my enclosure. As I looked around online I noticed discussion about what resin people used and it seemed to me as thought there were various options. I looked around locally and found a resin from Castin’ Craft called Clear Liquid Plastic Casting Resin at an art store near my house and purchased the resin and catalyst it was displayed with (both shown below). The resin and the catalyst I used for the enclosure. Now that I had everything in place I moved on to actually casting my enclosure. This process went pretty smooth early on, but it’s also when I found problems. I wrapped my entire mold in masking tape and started pour in my resin to lines I had specified and let it sit to dry out. The mold with resin poured into it. From what I had seen online I expected the resin to dry within a few hours, but my enclosure was still a viscous gel-like consistency after about 6 hours so I let it dry overnight. Unfortunately the resin was still not completely dry after this time period either. The enclosure was about 85% hardened, but all of my exposed edges were still a bit soft and extremely sticky. Somewhat disappointed I let the resin sit for another 24 hours thinking maybe it would set in that time, but yet again the enclosure was sticky and gel-like. As such I decided to remove the enclosure from the mold and see if it might harden better that way. The enclosure was solid and held shape, but never lost that sticky gel-like feeling on most of the outer surface. At the suggestion of a few online comments I started to sand the enclosure to try and remove that coating, but found myself with a softer and gummier surface the more I tried to sand. As such I started to look for other explanations. Ultimately what I gathered was that one of two things happened, either I didn’t use enough catalyst (which I’m doubting because I used more than suggested) or the resin I used was not the best choice for this type of project. 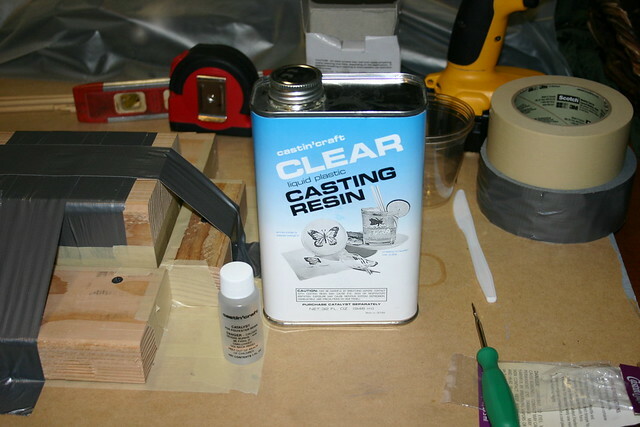 I’m leaning towards the second explanation because as I mentioned I used more catalyst than was listed on the can and the fact that most forums I’ve read about the Castin’ Craft resin say that it has a very bad/sticky surface when casting is completed. It appears as though they have some type of secondary catalyst or surface spray to cure the sticky surface, but at this point I have found a suitable enclosure so I’ve sidelined the sticky resin enclosure. This was an interesting project though and I do have plans to revisit resin casting at some point once I’ve done more research and made sure I have a resin that will not be a waste of my efforts. Regardless of the initial failure I thought it was important to share the experience online to show people that just because a project doesn’t work out the first time doesn’t mean you should give up completely on it. A couple of things you could try for your next casting project. -Once you take it out put it in the hot water cupboard over night to help harden it up or even use a warm hot air gun to heat it a little. What are your environment temperatures like. It should be above about 15 deg C I think . It can go below that here in winter out in the garage so I have to watch for that. -As mentioned you can sand off the top sticky layer but you really need to do this under water with wet/dry sandpaper. My projects have been sticky when removed from the mold but hard to say if they were as sticky as yours. The problem you are having is that polyester resin in contact with air stays sticky, no matter how much catalyst you add. Add too much catalyst, you might find the thicker parts of the casting getting so hot they blister. There is a type of polyester resin with a wax in it. The wax rises to coat the surface when it starts getting warm as the catalyst kicks off the hardening. Or you can do as I do, pour a small amount of extra virgin olive oil across the top right after pouring. It keeps air off of it, and washes off with any degreaser. Soap and water, windex, or 409 work great. If parts of the cast part inside the mold are sticky, there may be something in the masking tape that is preventing it from curing. I know that the sulfur in some kinds of modeling clay will inhibit curing of the surfaces. PS I’m Polymorph on Instructables. Nice inkjet conversion. Thanks for the advice guys. This casting is something that’s really interesting to me and I plan on revisiting at some point when I need to create another custom type of enclosure. I’m sure the pointers will greatly improve my future results.